The COBB Focus RS Front Mount Intercooler (FMIC) Kit combines our high volume intercooler core and our 2.5″ mandrel bent hard pipe kit into one package for the best overall intercooler upgrade. Intercooler efficiency is increased by up to 25% over stock due to the larger 26″x 8.6″ x 5″ bar and plate core. The cast aluminum endtanks include a custom designed fin on the inlet side that evenly disperses air across the core to aid in maintaining pressure in spite of the increased volume. 4-ply silicone couplers and strong worm clamps combined with the all aluminum construction of the hard pipe kit and core allow the entire system to handle much higher boost, even in extreme driving conditions…well beyond the original factory capabilities. If you plan to modify your Focus RS. Upgrading the intercooler should be very near the top of your parts list. We’ve gone to great lengths to thoroughly design and test this complete system to overcome all factory weaknesses while adding proven performance features of our own. 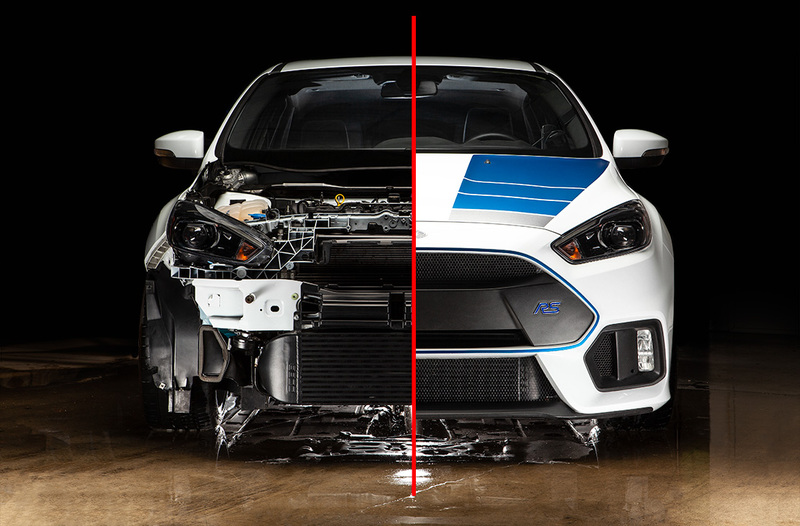 To make sure the COBB Focus RS intercooler allows you to find the cars true limits instead of being one of them.